Note: if you are interested in an overview of how you can benefit from a mobile access system, in parallel this this guide you can find more detailed information about our product here. In this fast-paced digital world, technological advanced has successfully substituted manual operations considerably. Consequently, it is impossible to imagine waking up without mobile phones. From waking up to the sound of the alarm clocks, setting up a meeting with clients, to doing online conferences, mobile phones have become an integral part of our quotidian existence, serving a plethora of functions. Going by the recent trends, mobile devices are ruling the world, shaping up the way we handle different systems to connect with people. Many security personnel work with mobile devices to monitor a specific area. This leads us to the newest innovation in mobile technology – the mobile access control. With mobile access controls, we are better disposed to access, view, and manage critical events by simply installing security software on the phone. Inadvertently, this technology, which is rapidly emerging as a viable alternative to physical access systems, ushers a new era of enhanced management activities. Mobile access control systems offer access to secured buildings, rooms and areas to the users with just a couple of clicks on mobile devices, such as smartphones, tablets and wearable devices. Apart from enhancing the operational convenience and ease of operations, such systems provide operators with a cost-effective solution for efficient management of identification credentials. As a highly efficient control system for the mobile-enabled workers, mobile access controls are undeniably a potent alternative to physical cards. There are many access control systems available in the market, from local systems that are operated by local servers to personalized cloud-based access control systems with numerous high-end features. Although local systems require one-time investment, the smartphone access is much more economical for long-term applications. The major variants of smartphone access control system include IP systems, control panel systems and mobile access credentials. The following segments offer a brief insight into the all of these systems. For start-ups or small companies, who work with only a handful of suppliers and clients, managing contacts is hardly a difficult task. However, big companies those deal with thousands of clients across the globe might fail to work with local systems. The cloud-based IP systems are specially designed for giant business, enabling them to access and manage data in the cloud. Control panel systems have a number of applications. They are often installed locally, allowing users to manage credentials and generate reports. These computerized systems, which are installed at workspaces, can be integrated into the security systems, ensuring the safety of the workforces. For many reputed institutions, controlling the access of office spaces can be a big concern. Mobile access credentials can be a boon to companies, enabling operators to keep a track of the entry/exit of the employees. Mobile access credentials are a secure way for license key holders to access a particular location. Some common advantages of these systems include ease of operation, improved security, and remote control of a specific location. The mobile-enabled employees can enter into a specific physical location with a few clicks on their phones. All accesses are generally managed in the cloud with an administrator granting and revoking mobile credentials. With more and more companies, both small and big, appropriating mobile access control systems, these systems have become an indispensable part of security systems in the corporate world. As opposed to printed identity cards and physical documents, mobile access control offers a more convenient experience for both workers and administrators. Access control has only one purpose, allowing/revoking access to resources or locations within the office premises. Access control can be broadly classified into two categories, physical access and smartphone access. While the former restricts access to rooms, areas and valuable assets, the latter can also limit access to computer networks, digital files and classified data. In this ever-growing digital world, it is crucial for businesses to shield discreet information. 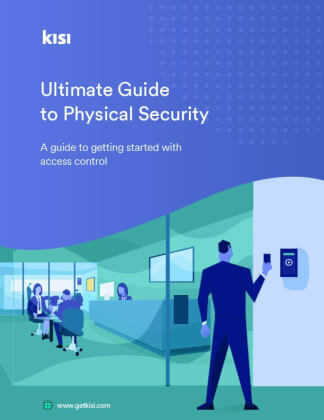 Although physical access control can be a reliable option, proper access control measures must be taken to ensure an effortless transition from one space to another. The mobile access control mostly comprises of identification, authentication, and authorisation systems. This type of access control is very different from physical access control which uses badges, keys and other physical tokens to get access to a particular location or asset. Businesses and other institutions accommodate a wide array of mobile access control systems, including password protected programs, biometric security systems, and other identification tools. With mobile access control systems, all accesses are regulated in the cloud by specialised security agents. Mobile access control systems come with a variety of technologies to enable smart access to restricted spaces and data. The following segment discusses the major technologies used in the cloud-based mobile access control systems. Generally, mobile access control manufacturers rely on Bluetooth to enable smartphone-enabled worker to communicate with a remote reader. Bluetooth Low Energy or BLE allows devices to communicate with remote users without the hassles of manual pairing. Long ranges of communication, including several feet, are done effortlessly with this Bluetooth technology, as it provides sufficient bidirectional bandwidth to power a secure connection. 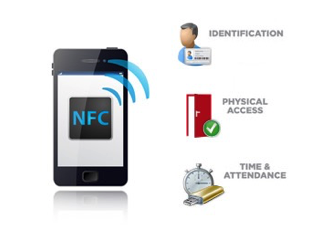 Apart from Bluetooth, other technologies like NFC can be used in mobile access control. NFC, the abbreviation for Near Field Communication, enables to set up a communication between a reader/lock and a mobile device. One disadvantage of NFC is that it only supports a limited range of communication, usually between a few of inches, and is unavailable to iPhone users that use iOS technology. Some of these control systems also come with QR-code detecting capabilities. In such cases, the reader is provided with a QR-code scanner for reading the employees’ code. This technology has the widespread popularity for allowing abundant flexibility to users. Today, almost all major platforms rely on a cloud-based service to generate a personalized security number. The reader or the lock is provided with this specific number to enable access to specific locations/assets. Before installing any high-end security system, it always recommended to carry out a thorough research to ensure a good selection. How do Users Deploy a Mobile Access System? 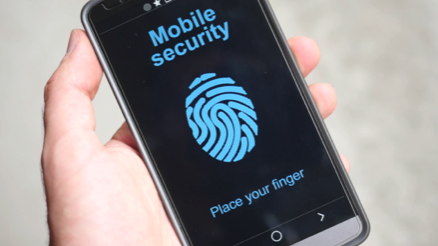 With smartphone users reaching 4.7 billion in 2017, the use of phones as security keys comes across as a convenient alternative to physical badges. Mobile access systems can be installed in all major commercial sectors, small start-ups to affluent organisations, to enable enhanced security. Let’s check out some ways to deploy the mobile access system. Such smartphone-enabled systems can be appropriated in the office buildings for ordering, distributing and managing users’ credentials. With mobile access control, providing mobile credentials to the workforce is primarily done through emails. Generally, the identification number or code is securely sent to users’ smartphones, granting them access to specific locations and IT assets. Administrative bodies or security professionals can use batch uploads via CSV or Excel files when adding users. With these systems, employees don’t need to check in to remote locations to flash temporary physical tokens. The access will be regulated virtually in the cloud, ensuring an outstanding user experience. With abundant flexibility and advanced security, mobile access control signals a revolutionary leap in the security management. The physical access control systems have given way to more advanced cloud-based systems that ensure smooth access to restricted spaces and classified documents, guaranteeing a convenient end user experience. 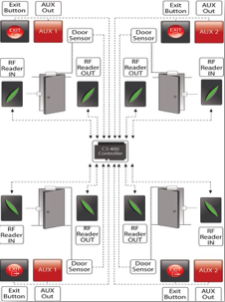 Equipped with leading-edge technologies, such as Bluetooth, NFC, RFID, Internet Switches, Internet of Things (IoT), PoE in Access Control, PACS, Wireless Access Control and Cat6-cable, mobile access systems are widely adopted by all leading brands worldwide for the efficiency of their operations. Consumers seeking such advanced security solutions are recommended to gather sufficient insight into these systems before installation to ensure best results for their companies. Kisi is currently the highest rated app (data from June 2018) on both the App Store and Google Play and our solution is used by ten of thousand of people every day. ‍Kisi's mobile access credentials are built for security paired with user experience: There is no need for the user to pair or download credentials. The user can just log in and everything is ready to use, just like mobile banking. When the authorized user approaches the door, he can just hold his phone to the wall reader and without opening the App, the unlock signal is being sent. For the user it behaves exactly the same way as a keycard. Once the unlock request has been verified by the cloud server, the user will receive a notification that the door has unlocked. If the door should not unlock, the notification will give the reasoning, e.g. an expired permission. Once the user walks through the door, the unlock event from the bluetooth access control reader is recorded along with the door opening event. Does the phone have to be connected to WiFi? No, the phone just needs any type of internet connectivity in the case it is configured as mobile only unlock. 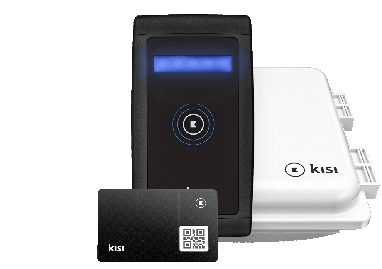 If there is a reader that can read secure and encrypted phone communications like the Kisi Reader Pro, in some cases no internet connectivity is required. Does the user have to pair the phone with the reader? There is no pairing required, it works instantly. 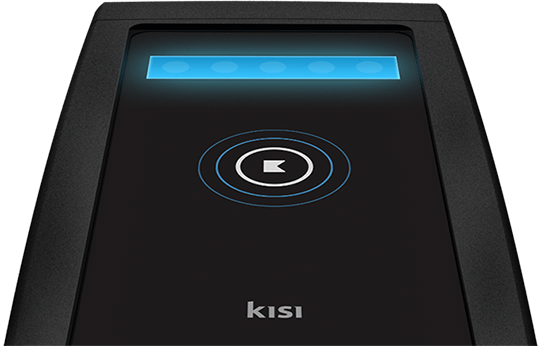 What you are used to from your home Bluetooth speaker is not the case for the Kisi Bluetooth access control reader. It's just you need to have Bluetooth turned on - Kisi does the magic. Most people use iPhone or Androids. Some people also use the link access should they opt to use a different smartphone platform such as Linux or Blackberry. Are both phones using NFC? Kisi uses NFC technology on Android and Bluetooth Low Energy (BLE) technology on iPhone. All modern iPhones have NFC compatibility so we'll most likely enable this in the future at one point as well. How long does it take till the door unlocks? It's typically faster than you can reach the door handle. We require the user to hold the phone just like a keycard to the reader and from there it's just a matter of milliseconds till the door unlocks. What if the system is offline? There is always an analog way of backup to get in the door. Just like there is coins as alternative to Apple Pay or credit cards.